The source code of tFacet is published under the GNU General Public License and hosted on Google Code. tFacet applies known interaction concepts to allow hierarchical faceted exploration of RDF data. The aim is to facilitate ordinary users to formulate semantically unambiguous queries so as to support the fast and precise access to information. Used interaction concepts are e.g. a directory tree and interchangeable columns that are already well-known from other applications. The directory tree, for example, is used to enable the intuitive exploration and selection of hierarchical facets. 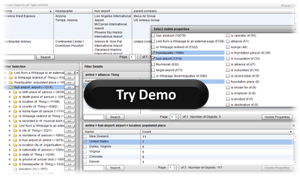 tFacet is based on the open source framework Adobe Flex and uses SPARQL to access RDF datasets. tFacet is readily configured to access data from the LOD cloud and only requires a Flash Player plugin to be executed (which is usually already installed in web browsers). All tools on this website are research prototypes that might contain errors. We do not guarantee their correct working and cannot offer comprehensive support. tFacet: Hierarchical Faceted Exploration of Semantic Data Using Well-Known Interaction Concepts. In: Proceedings of the International Workshop on Data-Centric Interactions on the Web (DCI 2011), volume 817, series CEUR-WS.org, pages 31-36. 2011. Sören Brunk and Philipp Heim.